Look what was at my front door when I got home from work a couple of days ago! If not - you are missing out! Vitatops and VitaBrownies are a delicious alternative to cookies and cakes at only 100 calories each. 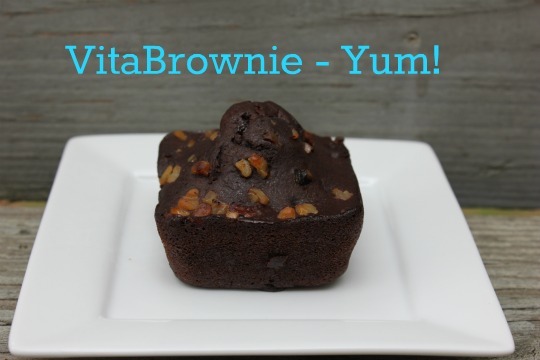 They are high in fiber and low in fat - kind of like a healthy brownie! Not only are they good for you, but they taste pretty fantastic too. I find them here locally in the freezer section of Martin's Grocery Store or you can purchase them online. I no idea they had all of these fantastic flavor choices! Banana Choco Chip, Deep Chocolate, Chocolate Mint, Fudgy Peanut Butter Chip, Apple Crumb, Triple Chocolate Chunk, Blue Bran, Raisin Bran - just to name a few. I had never tried the brownies before. Chocolate with no guilt - gotta love it! To be completely honest - I'll have to say I loved, loved, loved doing this review. I have absolutely nothing but good things to say about Vitalicious. Tasty treats that are good for you. Note - Vitalicious sent me samples for this review, but I was not compensated in any way. Follow Me and My Pink Mixer on Facebook and Twitter.